The question of scale has been with us at Transition Los Angeles (TLA) since our inception. The December 2008 Open Space circle that resulted in the formation of our city hub was on the concept of scale: how do you divide the big city into manageable portions to begin the Transition process? Let's face it, Los Angeles is huge. Wikipedia calls it a "megacity," and lists it as the second largest city in the U.S., and the 46th largest city in the world. Both of these calculations are flawed, and I'll tell you why in a minute, but let me suffice to say, we're one of the biggest, if not the biggest, metropolitan area in the world that is working with the Transition model. It was clear from the start that for Transition purposes, we would have to break it down into manageable chunks. But how do you go about doing that? 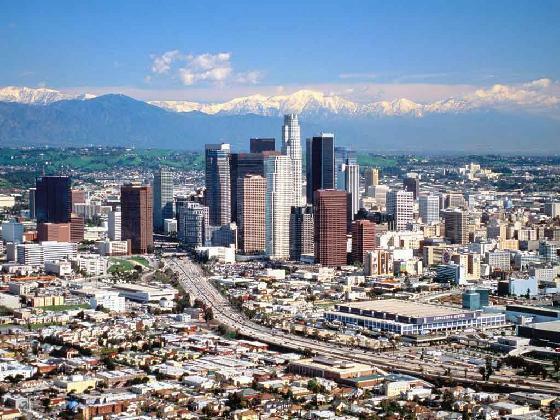 One of the immediate issues with Los Angeles is: WHERE DOES IT END? A quick search on Google for "Los Angeles map" gives a visual of the problem. 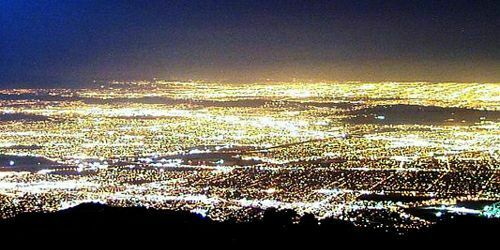 You see, there is the official City of LA (3.8million people and 498.3 square miles). And then there is the broader county (10.4 million people, 88 incorporated cities, 4752 sq miles). Then there is the geographic basin (35mi long and 15mi wide). And then there is the continuous development (urban area 12.9 to 17.8 million people, depending on how you cut it). Los Angeles flows. It doesn't end. One neighborhood merges into the next, with the only delineating factor being that the color of the street signs changes. Los Angeles county merges into nearby counties of Orange, San Bernardino, and Ventura without any gap in development. It flows over creekbeds, it flows over the river, it flows across mountaintops. The only thing that doesn't flow is that which is supposed to flow: the freeway system. At the time we formed TLA, we were reading Hopkins' materials and all of them described models of pure localization: live, work, play all in the same small UK town with very little need to travel. UK towns are apparently (I've never been there) separated from one another by farmland. Wow, what a concept. We have nothing like that here, no natural separaters which would help delineate between say, Transition Culver City and Transition Mar Vista. Natural geography is of little help in dividing the city into manageable chunks for Transition work. Most Los Angelenos are very accustomed to driving. This city grew up -- entirely -- during the age of the automobile. Thus people live in one neighborhood, drive their kids to school in another neighborhood (sometimes different schools in different neighborhoods for the kids in the same family). After school/work activities might be anywhere, and people think nothing of taking off across town for a shopping errand. People who work in the same office live in vastly scattered geography. Small businesses might serve clients across the basin. Friends live all over the place; family might not even live here, because so many Los Angelenos are newcomers to this city. We even encounter it on our sign-in sheet at Transition events. When we ask for zip code, people ask us right back: would that be work or home? mail or physical address? As far as a "sense of place," everyone here seems to have too many places and no real Place. In the December 2008 Training for Transition that included the Open Space discussion, Sophy Banks brought up the subject of Belonging. Where do people feel they belong? Where do they feel a strong sense of connection? The budding Transition Los Angeles team decided to go with that. In our initiating team, we had people who felt connected to a community garden in the Venice area. We had people who felt connected to a garden and meeting site in the Westchester area. We had people who were from a church in the Culver City area. That meant we had at least three sites to start with, where people felt a sense of connection. Regardless of whether attendees drove to get to those meeting sites, we decided to start with multiple local sites. It took us some time to feel really solid about building upon "Belonging sites" rather than pure localization. And it took a lot of explaining. We have continually been faced with explaining our unique solution to the problem. We came up with a diagram to describe it. The first version was a pyramid -- pods below and city hub above -- like a corporate org chart. But that didn't feel right. Then we hit upon the umbellifer flower form. We flipped the pyramid upside down and had a diagram that looked like fennel, which grows wild on our L.A. hillsides, or yarrow, a native California plant. The local T.I. sites - our L.A. pods - are like the flowers themselves. They're very visual, showy, and get all the attention. And behind those flowers, supporting them, holding them up, there is a seemingly delicate structure: the City Hub. The TLA city hub doesn't direct or regulate the pods; it supports and encourages them. They are independent, and each has a unique tone or flavor all its own. One of the primary functions of the city hub is to coordinate communication between the pods, which basically means the city hub keeps the pods talking to each other. Within the busy-ness of trying to run a T.I. while you're still maintaining a conventional job & family life, it's easy to forget about other pods in other neighborhoods of the city. But our monthly city hub core team meetings, and our core team leadership email list of shared resources and discussion keeps the "cross-pollination" going. Another important function the city hub serves around here is outreach. A few months back, we began plotting our pod sites and our attendees onto Google Maps . This highly visual resource reveals the reality of our initial 18 or so months of Transition action: it's all in a very limited geography. Right now (at 18 months of age) we're very coastal, we have very little penetration into the interior portions of the city. Outreach is hugely important. In a city like ours (well, in my opinion, in a city of any size) you're kidding yourself if you think you can somehow Transition just your own little neighborhood and call it "done." No way. No matter how many veggie gardens, water barrels, bicycles we set up in one small neighborhood, if we don't help nearby neighborhoods to do similar, then when shocks come to the System, the unprepared people will simply walk over and help themselves. Any one neighborhood is only as Transitioned as the whole. Outreach for us means speaking engagements all over the city. It means making space for the ones from other areas, outside the geography where we're already active. It means balancing the priority of helping new areas launch, versus deepening existing areas. We get so many speaking requests right now that we can hardly handle the volume which comes on its own. Even so, we're actively seeking to reach out into those new neighborhoods, to help them get started in the Transition journey. Right after we did the map, one of the first things we realized was, we were unprepared. We didn't have contacts in those areas. We needed to meet the people who could gain us the connections to get us the speaking engagements to meet the people who could get Transition action started there. So our first step was to make a conscious effort to make those connections. It will take a lot more than connections. As I've written about in articles about Diversity, our initial core team in Los Angeles isn't very ethnically or racially diverse. In order to gain credibility in ethnic neighborhoods, we will have to gain at least that first person of color who is able to speak on Transition ideas. We will have to tackle language barriers -- I heard once that the City of LA distributes its materials in something like 18 languages. To handle that, we will need to grow our core team to include people who have the skill set we lack. But I'm a firm believer that awareness is the beginning. We're aware of our shortcomings, and that means we're looking out for solutions. We're also aware of our new-ness, and we trust that as our organization gets known around town some of these problems will work themselves out. We don't have to do it all ourselves (see "threading the beads" concept). So which comes first, the city hub or the local sites? My answer is, "it depends." At what scale do you feel you could make a difference? Here in LA, our initiating circle was made up of people from widespread geography. Some of them were veterans at community organizing. Each of the people in that initiating circle fully realized that eventually we would need local Transition sites all over L.A., each covering a walkable or bike-able radius. Eventually we would all have to have our own groups. But in that Dec 2008 circle we also realized that we -- the initial leaders -- needed lots of mutual support as we began this process. We had gone through the Training together; we had a bond. We had a common mission and a common understanding which was considerably different from the mainstream. We needed each other. So we formed "Transition Los Angeles" as that gathering place. Its initial purpose was to keep the leaders going. It was only when we went to apply to Transition Network for official status that the question came up: did you intend for that to be a city hub? Hmmm, actually we didn't. We didn't set out to form a city hub; we kind of backed into having created one. By the time that question was on the table, Mar Vista was already planning how to create Transition Mar Vista. Culver City was already looking for people to fill out a steering group. "Let it go where it needs to go," our early Transition principle says. The structure in Los Angeles developed on its own evolvution. Part II of this article will continue with "Operations" at Transition Los Angeles.